JEE Main Paper 2 Answer Key 2018 - CBSE has released the final answer key on 31 May 2018. The answer key has been released in pdf format. Candidates can download JEE Main B. Arch set wise Final Answer Key from the link given on this page. 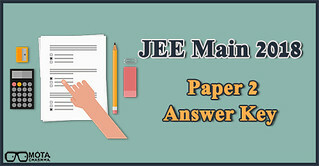 JEE Main official answer key for paper 2 contains the responses to the questions asked in the entrance examination. Candidates can match their marked responses with the solutions mentioned in JEE Main Paper 2 answer key 2018. JEE Main Paper 2 Result has been declared on 30 May 2018 on the basis of responses marked by candidates. For calculation of marks, the official marking scheme has been followed carefully. In case the responses in JEE Main paper 2 answer key were incorrect, candidates were able to challenge the answers with their valid proof. 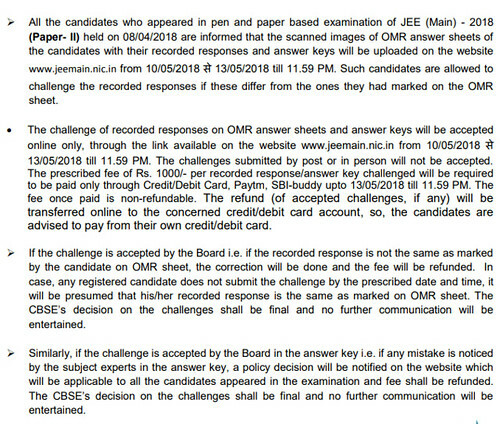 For challenging JEE main paper 2 answer key, candidates had to log in with the credentials and pay the requisite amount of Rs. 1000 per question in online mode. The last day of challenging JEE Main answer key was 13 May 2018. Read the article for more details on JEE Main Paper 2 answer key 2018 downloading process and challenging procedure. The answer key is only released for Mathematics and Aptitude Test not for drawing test. CBSE has also released the recorded response of the OMR sheet. JEE Main Paper 2 was conducted on 8 April for admission to B.Arch/B. Plan courses offered by NITs, CFTis, SFIs and other JEE Main B.Arch colleges. Latest Update - JEE Main final answer key for paper 2 is available now. JEE Main 2018 Final Answer Key 2018 has been released set wise on 31 May 2018. Candidates who have appeared in the entrance examination can compare their answers with the responses mentioned in JEE Main 2018 answer key for paper 2. The images of OMR sheet is also released along with the answer key. The result for JEE Main Paper 2 has been declared on 30 May 2018. Check the dates of availability of JEE Main Paper 2 answer key from the table below. Register Here for Alert on JEE Main Paper 2 Answer Key. How to Check JEE Main Paper 2 Answer Key 2018? To check the answer key of Paper 2 JEE Mains, candidates have to follow the respective link given above. After which the candidates have to match the answers with the responses given by them. Follow the link JEE Main Paper 2 Answer Key. CBSE has released the official answer key for JEE Main Paper-2 and the candidates can check the same from 10 to 13 May 2018. The candidates who appeared in the exam can view and match their scores. While challenging the JEE Main 2018 paper 2 answer key, aspirants have to submit a proof for their claim on the particular question. The candidates requesting to challenge the answer key have to pay Rs.1,000 per question challenged and the payment should be made through Credit Card/ Debit Card/ Paytm/ SBI Buddy until 11:59 pm of 13 May 2018. If the challenge is accepted by the Board, the correction will be done and the fee will be refunded. JEE Main Paper 2 Answer Key by Resonance has been made available on 8 April after the conclusion of the test. The answer key along with the solution can be obtained by the candidates by following the link given in the table below. JEE Main Paper 2 Official Answer Key has been released by CBSE on 31 May 2018. The candidates appeared in the exams and are looking for JEE Main Paper 2 Answer Key can check the same here. Besides this, aspirants can also check JEE Main paper 2 solutions for previous years from the table below. In case of any query regarding JEE Main Paper 2 Answer Key 2018, you can write to us in the comment section below.